It’s a well-known fact that bridesmaids are not supposed to upstage the bride on her wedding day. But it seems Dawn French and Jennifer Saunders didn’t get the memo or in the name of comedy and indeed charity they decided to ignore it. 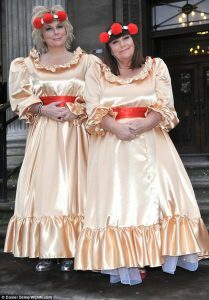 In 2013 they attended a real-life wedding organised by comedian Miranda Hart in aid of Comic Relief, the comedy duo got more than a few laughs in their massive dresses and Red Nose themed tiaras. The funny thing is back in the 80s this style of bridesmaid dress was considered beautiful! !